• Tubercle bacilli are conveyed by droplets. they then gain entry into the body by inhalation. nurse to obtain the sputum culture? Copyright © 2017, Elsevier Inc.
down the drug. Called acetylation. – Some people have a genetic deficiency of the enzyme. INH downward in these patients. – About 50% of Americans are slow acetylators and 50% fast. Avg. plasma level is 30-50 times higher in slow acetylators. • Fast acetylators may need more drug. • Slow acetylators - higher risk for some side effects. C. he should not take INH. – Long acting analog of rifampin. • Obtain a thorough medical history and assessment. • Patient education is critical. • Therapy may last for up to 24 months. regimen for improvement of condition or cure. improvement or cure of the condition. alcohol while taking any of these medications. derivative (PPD) test on the right forearm today. C. 48 hours after performing the test. A patient is receiving INH for the treatment of TB. administering with the INH to prevent INHprecipitated peripheral neuropathies? orange when she voided this morning. effectiveness of her birth control pills? – Decongestants reduce nasal congestion. • Should measure every A.M.
as a result of the disease process. 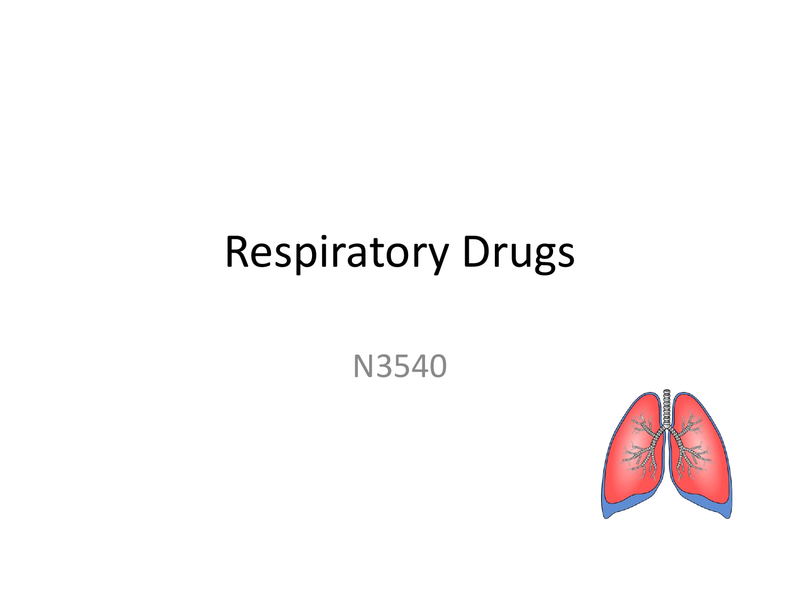 inhalers (MDIs) as well as solutions for inhalation. times to use to reverse an acute attack. activity that triggers an attack. effects & risk of toxicity. if dose continues to be increased. and narrowing of the airways. concerning the inhaler is effective? prior to using the inhaler. inhaler canister as inspiration begins. Administer cautiously & monitor for sensitivity D/T decreased drug metabolism. Instruct to never chew or crush sustained-released dosage forms. Monitor serum levels to avoid possible toxicity/ ensure therapeutic blood levels. asthma or to replace ICS. often used in conjunction with other agents. prophylactic. Not used as rescue med! • Cromolyn nasal drops (Nasalcrom) prophylaxis or tx. • Teach pt. To use metered-dose inhaler correctly. • Monitor pulmonary status before and immediately after therapy. immediately after the drug is instilled. __________ to treat the underlying inflammation. • Reduce shortness of breath. • Control coughing and wheezing. therefore used to prevent bronchospasm. • Pedi safety < 12 yo not established. – Take off the cap and shake the inhaler hard. instructions that came with your inhaler for how to do this. – Breathe out all the way. – Hold the inhaler 1 to 2 inches in front of your mouth (about the width of 2 fingers). – Keep breathing in slowly, as deeply as you can. reduce side effects from your medicine. out this date, divide the number of puffs your canister contains by the number of puffs you take each day. May 1, replace it on or before May 25. Write May 25 on your canister. before you run out of medicine. Puff counters can also be bought at a drugstore or online. is under pressure. So make sure you do not get it too hot or puncture it. National Asthma Education and Prevention Program. How to use a metered-dose inhaler. Hold the dry powdered flat with one hand. Don’t shake it. Turn your head to the side and breathe out-do not breathe into the inhaler. Breathe in fast and deep through the mouthpiece. Close the device when you’re finished so it will be ready for your next dose. You may not feel or taste the medicine. powdered inhaler dry and never take it apart. Take the cap off inhaler and spacer. Attach the spacer to inhaler. If inhaler not used in a while, may need to prime it. Keep breathing in slowly. Breathe as deeply as possible. Take the spacer out of mouth. Hold breath & count to 10, if possible. Purse lips and slowly exhale through mouth. After using inhaler, rinse mouth with water, gargle, and spit to reduce side effects. canister back inside. Put the cap on. Do not rinse any other parts. Write on canister the date inhaler needs to be replaced. • Store inhaler at room temperature. It may not work well if it is too cold. too hot or puncture it. direct action of the cough center in the medulla. – pulmonary complications of CF. first for an acute asthma attack?